Want to see Quito, but don’t want a group city tour – then take a look at our self-guided walking tour. 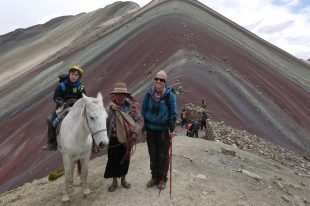 Our rep in Ecuador, Emma Morgan, has lived in the capital for over a decade and shares her top independent walking tour. Go at your own pace, choose which sites to enter and no stopping for that ‘kodak’ moment unless you decide to. Map? Check. Some cash? Check. Adventurous attitude? Check. Well, let’s go on a Quito self-guided, independent walking tour. “This covers the basics of Quito and would take you a good few hours, to make it shorter you could start by getting a taxi to La Basilica and then begin from there. “I always recommend when walking around old town to leave handbags/backpacks/valuables in your hotel. Just take some money in your pocket for something to eat, a bit of shopping and taxi rides and a camera for photos. This way you just have a couple of things to worry about and will have a much more relaxed day. “An umbrella or waterproof can be handy since the weather can change especially in the rainy season (sunny mornings / rainy afternoons). “If the parks El Ejido & Alameda look particularly deserted it is best to follow the paths around the edges rather than walk through the middle. Start in the ‘new town’ e.g. Café Cultura area, then walk through El Ejido Park (art market here on weekends), then onto Alameda Park (where there is an observatory). From here walk up to the Basilica, where you can visit the church – climb the towers or just enjoy the ‘gargoyles’. Then walk all the way down along Venezuela Street – you pass a little Camilo Egas Museo (famous painter) which is interesting – before you get to Plaza Grande. It’s great for people watching in the Plaza. On this plaza you have Tourist Information (with a little shop), the Government Palace and the cathedral, also the Centro Cultural Metropolitano where they have interesting exhibitions. From Plaza Grande, take the street which runs south from the south west corner (Garcia Moreno St) which brings you to the Compania de Jesus Church. This is famous for its gold and definitely worth going in. From here you turn right into Sucre Street and walk up to the San Francisco Plaza where you have the San Francisco Church and Monastery (with religious art museum). The little shop/café under the church, Tianguez, is a great place to stop for a coffee and to shop for handicrafts – the shop is in the crypt under the church so added interest. From here I would suggest a back track (to keep on more busy streets) to the corner of Sucre and Garcia Moreno (where La Compania is) and then take a right turn along Garcia Moreno, this takes you to the Museo de la Ciudad – again worth a visit if you have time. If not, keep going till you come out onto the Boulevard 24 de Mayo, here on your left-hand side you should see the archway which leads you into La Ronda Street – so you can walk and explore La Ronda, then take a taxi to your hotel.